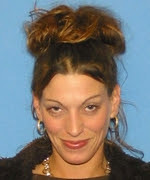 Last month, the state’s Department of Motor Vehicles issued a Delaware identification card to a woman using her own photograph but another woman’s biographical information, state police said today. Questions: 1. Why didn't the state verify the individual's identity prior to issuing the ID card? 2. Was the expression on the fraudster's face in the ID photo a clue?? How secure do you need your ID card? I've notice that you can go on web sites like Big Huge Labs and make a photo ID card in about 30 seconds that can be printed and laminated. And you can have a bit of fun doing it! Of course there is limited card design ability and card technology (mag stripe, prox, rfid) can not be incorporated. Nor will the card include any security features like holograms, UV ink, or special card elements. Here's the thing. 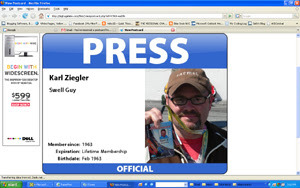 Sites like this point out how easy it is to make a photo ID card. Making a secure, well made photo ID card is a different story which is in part why guys like us exist. How important is your ID card security? Would it shock you if an 8th grader could reasonably reproduce your card on-line or with Photoshop? We often tell customers that they can choose how secure (or unsecure) their card is based on design choices. It's simply up to you. 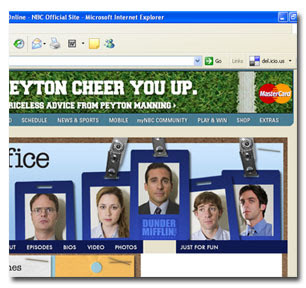 OK this is weird to point out, I know, but the badge clips used in NBC's website for "The Office" are not quite right. That's nerdy of me, but c'mon get it right. I mean, that totally wouldn't work unless you were wearing that 152090 in conjunction with a 153076. OK, that was nerdier still... help me. This news story came to my attention just a few minutes after the last post. No kidding!! Check out the YouTube use by the news organization. By the way, also check out the dog photo on the passport in the video. Years ago there was a rumor about a Pentagon employee that pasted a dog photo over his image on his DOD photo ID card. So the big question for me is does face averaging work with average faces? People say I look like someone else all the time! Does a video for business use need high end production values or just communicate the intended message? Should any videos posted address a specific, unique topic or is it OK to load up "canned" marketing style product videos? Would a library of specific application videos be handy? Don't you think this is a better use for this medium that seeing all the videos of some poor sap getting hit you know where with a blunt object? Perfect for the Bartenders (and Bartender Wannabees) out there. The Chattahoochee River National Recreation Area (governed by the US National Park Service) has made a huge step up in technology by adding pay-to-park kiosks in several locations. These kiosks replace cash boxes and paper passes that visitors had to use in order to park in the day-use areas through out the greenway in metro Atlanta, GA. The free-standing kiosks contain credit-card swipe readers, touchscreens, and a PVC card printer. 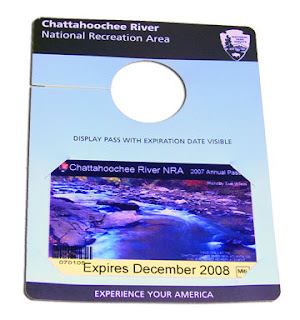 When a visitor walks up, they have the option to buy a day pass (paper receipt) or an annual pass (PVC Card) for all of the parks in the domain of the CRNRA. They are currently active at the Johnson's Ferry and Jones Bridge units of the park. I for one am glad to see PVC making its way into this arena. In the past, the visitor passes were either custom printed stickers or paper hangtags that were punched on the side to indicate when the pass was purchased. The new cards' beautiful design includes one of the many shoals on the river, in a photo by Tom Wilson. Get yours today, and you'll never have to carry three 1$ bills to the park again. So what does Badge-A-Rama mean to you? The thing is as a "photo ID guy" the first thing I thought when I saw "Badge-A-Rama" was it had something to do with photo ID cards. And when I saw the retro logo it made me think of my past life. What do you think when you see "Badge-A-Rama"?? Are there any ID card printer manufacturers in the industry hip enough to stick this name tag on a new printer model? Would people show up to an industry trade show with this name if it focused on the core of ID card technology? Are the towns in the USA that have enough companies to outsource ID card making to a drive-thru ID card production operation by this name? How many people would stop and ask for a "fake ID card"? What flashes through your mind? What do you think?! Can't we all learn from "The Office"? "Everyone always wants new things. Everybody likes new inventions, new technology. People will never be replaced by machines. In the end, life and business are about human connections. And computers are about trying to murder you in a lake. And to me the choice is easy." 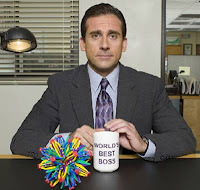 Michael Scott - "The Office"
It seems everyone likes sophisticated technology, but needs simple, elegant solutions. That is what we kept in mind when we designed our new catalog. We distilled alot of technical options and jargon to make the selection process much easier. We think you and Michael Scott will like what we did. Isn't that everyone? Enjoy.